It’s still so cold. How cold is it, you ask? It’s so cold, we couldn’t wait until February to list all the events going on in February. Or to remind you that winter schedules are still in effect, including the occasional weather-induced closing, so please be sure to check ahead before stopping by our sites and museums. Fort Pitt Museum and the Railroad Museum of PA will be open on Feb. 17 for Presidents Day; the other Trails of History sites will be closed. Post by Friends of Washington Crossing Park. Feb. 9: Mrs. Jefferson – a Presidents Day Program—Costumed interpreter Gina Marie Aleo will present a program about Thomas Jefferson in honor of Presidents Day. Program is free, but admission is charged to visit the museum’s exhibits. 2 pm. Feb. 23: Railroad Movie Day—The museum will show the film The Hard Coal Roads – What Went Wrong, a look at anthracite railroads of the region. Program is free, but admission is charged to visit the museum’s exhibits. 2 pm. Feb. 16: Fireside Tales—children ages 4-8 and their families are invited to enjoy an afternoon of storytelling and learn about Native American life in the colonial period. Dress for the weather and bring an extra blanket if it’s really chilly. Hot chocolate and cookies will be served. $2 donation is suggested; regular admission is charged for touring the Boone Homestead and the historic area. 2 pm. Feb. 23: Black History Lecture—Dr. Teresa Gilliams, Associate Professor of English at Albright College, will explore the social construct of race and how it has shaped the celebration of Black History Month. $2 donation suggested; regular admission charged for touring the historic buildings. 2 pm. Feb. 8: Pithole Sledding Party—Enjoy an old-fashioned sledding party at historic Pithole complete with hot chocolate and cookies. 11 am- 2 pm. RSVP DEADLINE IS TODAY, JAN. 31! JUST ADDED TO T'HEADS: Feb. 15: Family Day—Enjoy indoor activities for all ages, including an oil-themed art activity with the Titusville Arts Council and a scavenger hunt. More info is on Drake Well's Facebook page. Feb. 6, 13, 20, 27: Winter History Class—each Thursday participants in the Winter History Class learn about the history of the celibate brothers and sisters, the world they lived in, and the work of preserving the collections and buildings. Check out the class schedule for details. Feb. 8: Making History Workshop, Fraktur—learn about this unique form of writing and make your own letterform. Appropriate for older kids, teens, and adults. Fee is $15 ($10 for Ephrata Cloister Associates members). 10 am-noon. Feb. 12: Story Time—designed for pre-K students, this program will pair a story with age-appropriate hands on activities to help young learners and their adults explore the historic site. Cost is $6 for one adult and accompanying child (age 3-5), $3 for each additional child; program is free with Ephrata Cloister Associates Family Membership. 10-11 am. Feb. 22: Making History Workshop, Colonial Medicine—explore 18th-century ideas about health and make a sample of spring tonic. Appropriate for older kids, teens, and adults. Fee is $15 ($10 for Ephrata Cloister Associates members). 10 am-noon. 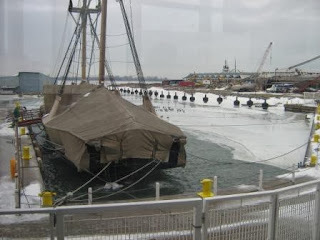 Feb. 21: Wintertime at the Maritime—Celebrate winter at an outdoor (say what?!?) party in the 2014 (so far) snow capital of the US. Seriously, looks like fun, with fire pits, heated tents, and warm adult beverages. It’s also a fundraiser and part of your ticket price is deductible (depending on your tax situation—consult your tax adviser or take her/him to the party!). Must be 21 or older to attend. Advance tickets ($60 per person, $100 per couple) can be purchased online; tickets at the door are $65 per person. 6-9 pm. Feb. 5, 12, 19, 26: Homeschool Classes—Activities and age ranges vary; check the website for details. UPDATE 2/10/14: The dinner was postponed to Feb. 15 and tickets are available as of 2/10; call 717/581-0591 for detailsFeb. 8: Victorian Valentine Dinner—a lovely evening with chocolate and champagne in the Visitor Center, a horse-drawn wagon ride, and dinner in the historic Landis Valley House Hotel (complete with strolling violinist). Pre-paid reservations required. Cost is $140 per couple; bring a sweetie or bring a friend. Menu and complete details are on the website. Feb. 16: “I Thee Wed” exhibit of wedding attire from 1830 to 1930 closes. Feb. 22: Heirloom Seed Project workshops—Offered in partnership with Backyard Fruit Growers, sessions cover a variety of topics. Visit website for class descriptions and registration info. Feb. 12: Behind the Scenes Tours—a chance to see in person what’s happening with the restoration of the Rapp Houses (sneak previews are posted on OEV’s blog) plus 19th-century clocks in collections storage. The evening also includes a wine and cheese reception. Reservations are required; cost is $25 ($20 for Friends of OEV). The website has more info. 6-9 pm. UPDATE 2/5/14: UNFORTUNATELY, THE WEATHER HAS FORCED THE CANCELLATION OF THIS EVENING'S TALK Feb. 5: Friends of PMM Richard Koontz Memorial Lecture Series—SGT MAJ Joseph Keirn, 99th Regional Readiness Command (Ret. ), will present a talk entitled “The Battle of the Bulge M.I.A. Diggers,” about an international team of private citizens working to recover the remains of infantrymen listed as missing in action since 1944. 7:30 pm. Feb. 8: Community Free Day and African American Read-In—the Read-In will feature local African American authors and illustrators providing examples of their work. All children attending the event will receive a free book. Museum admission is free on this day. 9 am-5 pm. Feb. 14: Learn at Lunchtime—the Giant Traveling Map of Pennsylvania will be on display in Memorial Hall for visitors to explore and learn about the state’s geography. Admission is free between 11 am and 1:30 pm. Feb. 16 & 23: Exhibitions on Screen—presented by Susquehanna Art Museum (SAM), this three-part film series (3rd installment on March 2) explores exhibitions of the works of Manet, Munch, and Vermeer. State Museum and SAM members receive discounts on tickets; single show and series tickets available. Details are available here. Feb. 21: 3rd in the Burg—open galleries and special presentations by museum staff and volunteers are on the agenda for this monthly event. Museum admission is free from 5:30 to 7:30 pm. Feb. 28: Curiosity Connection StoryTime reading series—Featured book is Peter’s Chair by Ezra Jack Keats. The reading series continues March 7, 14, and 19. Included in museum admission. 10-11 am. 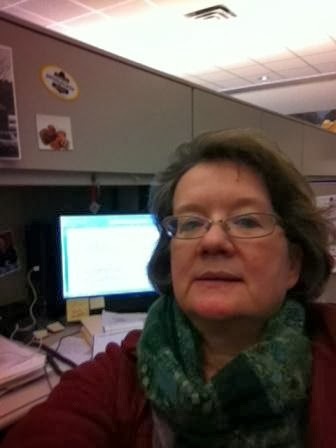 My museum selfie – me working on this post. but you can’t seem them in the photo. With apologies to those of you who loooove cold and snow or who are obsessed with the outcome of the National Football League’s annual showdown, I’ve decided to start thinking about baseball and spring training. Makes my toes just a little bit warmer. Yes, I care who wins the Super Bowl, but not as much as I care about seeing this cold and snow in my metaphorical rear-view mirror (on my metaphorical Bentley). So there (metaphorically). Applications for the PHMC’s 2014 Keystone Summer Internship Program are now available; submission deadline is February 14. Reservations are still available (or were, earlier this week) for Valentine Dinner on Feb. 8 at Landis Valley Village and Farm Museum. And in honor of their “I Thee Wed” wedding attire exhibit (closing Feb. 16), LVM has announced a March 22 bus trip to see the Downton Abbey costume exhibit at Winterthur Museum and Gardens in Delaware. Ephrata Cloister’s Winter History Class starts Thursday, Jan. 30, and continues through March — you can find the line-up of sessions and info on how to register here. Graeme Park and Hope Lodge are both nominees for “Most Happening Historic Spot” on the Montgomery County Happening List. Graeme Park is also nominated for best wedding venue. Vote early and vote often. That’s the Trailheads way. Okay, and we can look back a bit, too. The Scranton Times-Tribune published a nice article about the Anthracite Heritage Museum’s recent program on the 55th anniversary of the Knox Mine Disaster, including a short video of musician Lex Romane performing original music about the event. 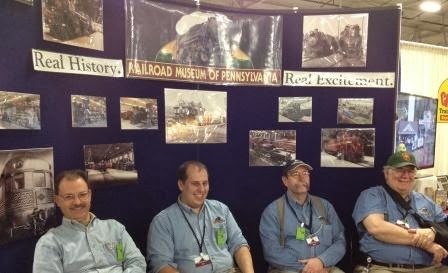 Staff and volunteers from the Railroad Museum of Pennsylvania were on hand to promote the museum at a massive model railroading show at the Greater Philadelphia Expo Center last weekend. 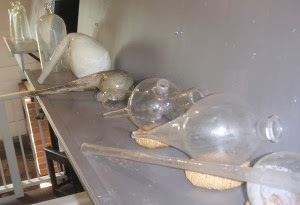 I’ve posted a couple of links to the new blog at Old Economy Village in past weeks, but missed some other Trails of History blogs that may be of interest. So, here are links to Life in Landis Valley, Chronicle Ephrata, and the Graeme Park Commonplace Book. 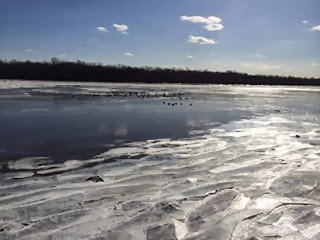 "Oh, Amy – do you really think that puny ice sheet at Pennsbury Manor impresses anyone up here in the great northwest (insert coyote howl)? Erie has led the pack all this year as #1 Snowiest US City…and as I write, we’re still well ahead of Buffalo, despite their latest efforts to unseat us….We Erie folks all know in our hearts that when Paul Allman Siple (see PHMC historical marker in front of the Erie Maritime Museum) devised the “Wind Chill Index,” he was not thinking about his adventures with Admiral Byrd in Antarctica, but rather was fondly remembering his boyhood in Erie, walking to school on a typical winter’s day. "The U.S. Brrrrrr-ig Niagara would be held fast in the ice were it not for strategically placed agitators keeping the water moving alongside her hull. The crew is working diligently on off-season maintenance tasks, often outdoors. 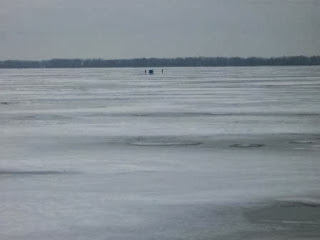 Even as I write, we are experiencing a bit of a heat wave (38° F), which has not totally discouraged ice fishermen, who prefer it a bit brisker. Erie Bay had frozen all the way over earlier this week, when temps were closer to -10° F, and will refreeze next week." Thanks, Linda, for the response. I am hopeful that this does not escalate into a full-on Trails of History [censored] contest. Unless it would increase readership—then I’m all for it. Drake Well Museum’s Mobile Energy Education Training Unit (MEET-U) received some good news coverage this week when it visited the Learning Enrichment Center in Warren County. I’m not as timely with this as I could have been, but Washington Crossing Historic Park shared some photos on Facebook from the Dec. 25 reenactment of Gen. George Washington and his troops crossing the Delaware River to attack the Hessians occupying Trenton in 1776. They shared photos from the Wall Street Journal’s “Metropolis” blog, Nick Dampman Photography, and the Bucks County Courier Times. The latest post from Old Economy Village's blog about the Rapp Houses restoration project http://oldeconomyvillage.org/work-on-the-rapp-houses-until-now/ includes gorgeous photos of the reproduction wallpapers and the original remnants on which they were based. THIS JUST IN: New post this morning showing changes to doorways and walls! If you’re in (or traveling to) the Scranton area this weekend, the Anthracite Heritage Museum is once again presenting Robert Hughes and his one-man play A Miner’s Tale. Showtime is 2 pm and admission is $5 and also includes touring the museum exhibits. More information on upcoming January events can be found in last week’s post. Ready or not, here comes 2014. Winters are quieter on the Trails of History, with fewer special events, but there’s still plenty to see and do. A few sites are closed (although many of them can make arrangements for visits for those who call ahead) and others are on reduced schedules. It’s a good idea to check ahead to avoid disappointment. Jan. 12: A Miner’s Tale—learn about the life of an anthracite miner through spoken word and dramatic presentation, written and performed by Robert Hughes. Admission charged. 2 pm. Jan. 18: Knox Mine Disaster—this program looks at the events of Jan. 22, 1959, when the Susquehanna River flooded the mine at Port Griffith (Luzerne County) and explores the effects on the local community. Admission is free. Snow date is Jan. 25. 2 pm. Jan. 30: Winter History Class—first of nine weekly sessions exploring a variety of topics related to the Historic Ephrata Cloister and the world in which it existed. Classes continue each Thursday through March and conclude with a field trip in early April. Cost is $50 ($40 for members of Ephrata Cloister Associates) with an additional fee for the field trip; or you can pick individual sessions at $8 each. Call 717/733-6600 for details or to register. 9 am-noon. Jan. 5: Twelfth Day—glimpse the Priestley family’s life in Northumberland with a taste of the English customs they remembered. The house will be decorated as an English country manor, costumed docents will be on hand, and there will be chemistry demonstrations and children’s games. Admission charged. 1-4 pm. Jan. 17: 3rd in the Burg—there will be an opening reception for the Susquehanna Art Museum’s Doshi Gallery exhibit, “Lost World/Found World.” Free admission (during the rest of its run the exhibit is included in regular admission). 6-8 pm. Jan. 19: Last day to see “A Twentieth-Century Christmas Tradition,” exhibit of the Gruff Family Christmas Display from the museum’s permanent collection and model trains from private collections. Included in regular admission.